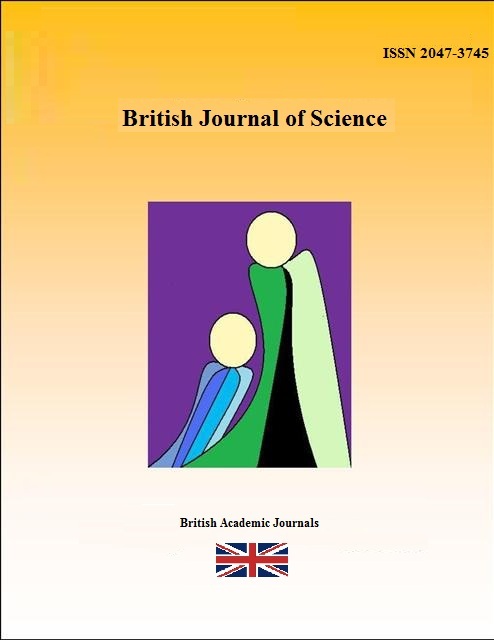 The British Journal of Science (BJS) is an international, refereed, and abstracted journal. The British Journal of Science is a monthly, peer-reviewed international research journal that addresses both applied and theoretical issues. The scope of the journal encompasses research articles, original research reports, reviews, short communications and scientific commentaries in the fields of applied and theoretical sciences, biology, chemistry, physics, zoology, medical studies, environmental sciences, mathematics, statistics, geology, engineering, computer science, social sciences, natural sciences, technological sciences, linguistics, medicine, industrial, and all other applied and theoretical sciences. The journal publishes both applied and conceptual research. The articles in the journal are open access to different users in different countries around the world. Knowledge produced in the journal is meant for all scholars specialized within all disciplines of sciences. In order to contribute rapidly in the advancement of scientific research, the journal should be accessible for all. The British Journal of Science published from UK. The journal release volumes monthly. The full articles are published on-line one month before the date of release. All articles appearing in the volumes are peer reviewed. Each article submitted is screened by the editor and then sent for peer review. The reviewer remains anonymous to the authors. British Journal of Science is indexed in ProQuest ABI/INFORM Genamics, Elsevier Bibliographic Databases, EMBASE, Ulrich, DOAJ, EMNursing, Compendex, GEOBASE, Scopus, and Mosby. British Journal of Science is monitored by Science Citation Index (SCI). Submissions are accompanied by a letter indicating the author's e-mail address, institution, and other contact details. Articles should be single-spaced followig the latest edition of the Publication Manual of the APA. See the manuscript preparation guidelines. Articles are submitted to the editor at office.sjournal@gmail.com.